"I'll do anything .... anything!" 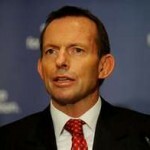 Now Tony Abbott has announced that he’ll re-create Prime Minister John Howard’s ‘golden age’. And wasn’t it a false golden age, born out of the false prosperity of the greatest real estate bubble in Australia’s history, anyway? You want all that again, Tony? A mirage that makes people happy until the bubble bursts? Mind you, I don’t think Malcolm Turnbull or Julia Gillard have anything real to offer, either. 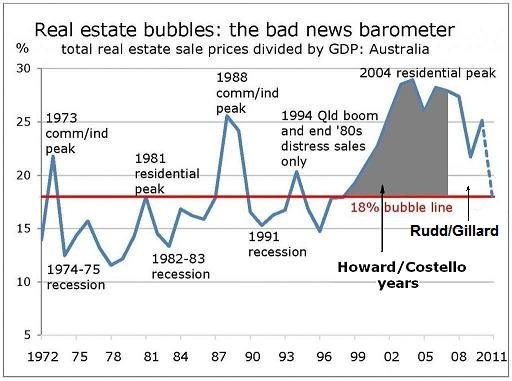 It's a bubble alright - and it aint burst yet! An all-in land tax—in which the poor widow will be looked after—and abolishing the 125 penalty taxes recommended by the Henry Tax Review would fix this financial impasse quickly, Tony and Malcolm and Julia. Oh, but then none of you can extract yourselves from the pockets of the 1%, can you? Bit difficult? I agree about maintaining the mirage. Also offering the un-taxing of labour and capital as a quick(er) exit when the ship hits the span. That’s largely the recovery plan that Prosper Australia is proposing to put forward. Can’t disagree with your assessment. I suspect all anyone hopes is that they can maintain the mirage for as long as possible. One option you might want to look at is packaging this as a recovery plan after things go wrong. That is the point people will be looking for an alternative structure that prevents it happening again. All a little late in one sense, but an opportunity not to be missed in another. Flowhold is a more politically palatable packaging in the meantime, and gets the principles operating and known.